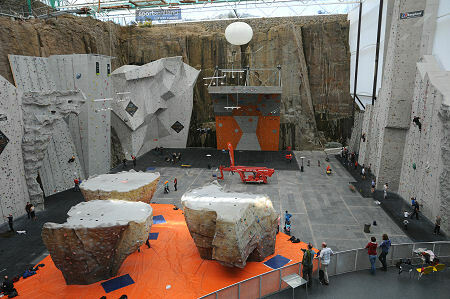 First time visitors to the Edinburgh International Climbing Arena should expect to be awed, not once, but twice. The path that leads you down from the car park does nothing to prepare you for the incredible frontage of the centre (see image at the foot of the page). But even this leaves you gaping in awe at your first sight of the climbing arena, shown above, which is unlike anything else you've ever seen outside of a James Bond film. Take a disused rock-walled quarry 100ft deep. Construct a high tech building across the front of it, three storeys high at the sides, dropping to five storeys high in the centre. Then roof over half the quarry itself, put in a wall to divide the roofed area from the unroofed area, and add in huge artificial climbing walls to complement the available natural rock. 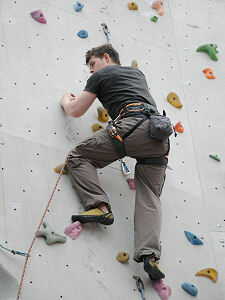 The Edinburgh International Climbing Arena lies some half a dozen miles west of Edinburgh, close to the village of Ratho (though not directly accessed from it). Access is from the B7030 Linburn to Newbridge road, up a well-signposted new road that leads you to the car park. The focus of activity is the arena. This comprises the largest set of indoor climbing walls in Europe, with 2,400 square metres of artificial wall, and over 400 square metres of bouldering. 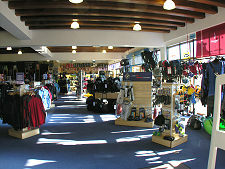 As a result the centre is already attracting climbers and competitors to its events from all over the world. Walls on offer range from 12m to 28m in height. Amongst the Centre's other features is the Aerial Assault course. Anyone over 140cm in height can tackle this suspended aerial rope course, incorporating a zip wire, nets, logs, ropes and other attractions, all suspended a vertiginous 25m above the floor of the arena! Booking in advance for the Aerial Assault is advisable. 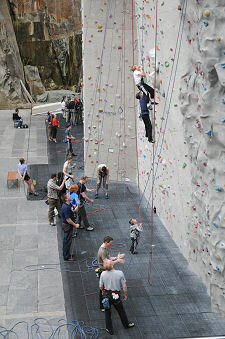 Add into the mix an excellent outdoors and climbing shop; a health and fitness club including a gym, a spa and a fitness studio; a conference centre; and a cafeteria and you have a rough idea of what the Edinburgh International Climbing Arena has to offer. 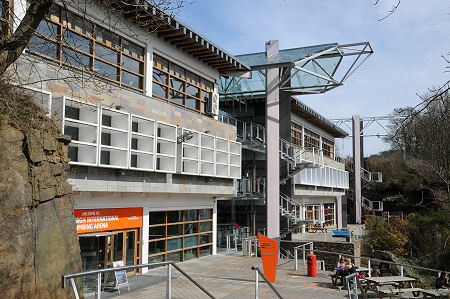 Originally known as the Ratho Adventure Centre, this magnificent facility fell into financial difficulties in 2005. It was rescued by the City of Edinburgh Council and closed in August 2006 to allow a £6m refurbishment which included completion of many previously unfinished aspects of the centre such as the car park. 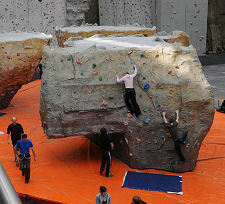 The Edinburgh International Climbing Arena, Ratho, reopened its doors on Friday 25 May 2007. STB 5 Star Activity Centre.